Naruto, the monkey filed a lawsuit in San Francisco federal court this past Monday. Well, not quite, but the People for the Ethical Treatment of Animals (PETA) are suing on Naruto’s behalf, claiming ownership rights to a photograph the money took of himself back in 2011. Peta to the rescue? If this case is taken seriously and Naruto actually wins, it will be the first time in the United States court system that an animal is not property himself, but rather owns property. Back in 2011 on the Indonesian island of Sulawesi, Naruto grabbed photographer David Slater’s camera and snapped a photo of himself (ie. a selfie). Slater subsequently claimed ownership of the photo because it was taken with his camera. Since then, Slater has received a fair amount of backlash and disagreement from critics. Many feel that the photo would be owned by Naruto if monkeys could own property, but since they cannot legally own property, the image is in fact not copyrightable. Here is where PETA comes in. PETA, on behalf of the monkey (since monkeys cannot talk), is suing Slater himself, Wildlife Personalities (Slater’s company), and Blub (San Francisco based publishing company who published the photo of Naruto). PETA is seeking monetary damages and a ban on the sale of the photograph. Naruto would like to manage the copyright of the photo himself and receive all proceeds from the sales of the selfie. PETA is claiming they will not receive any compensation. Let’s humor ourselves for a minute and assume Naruto the monkey can legitimately bring this case in federal court and the court rules in favor of PETA. Now this monkey – incapable of writing, reading, speaking and earning income— owns a piece of property (ie. a picture of himself), that has already gone viral and generated numerous sales. Section 61 of the U.S. Code defines gross income as “income from whatever source derived,” unless otherwise excluded in the Code. Ultimately, the government is owed taxes from the taxpayer for any and all gross income. 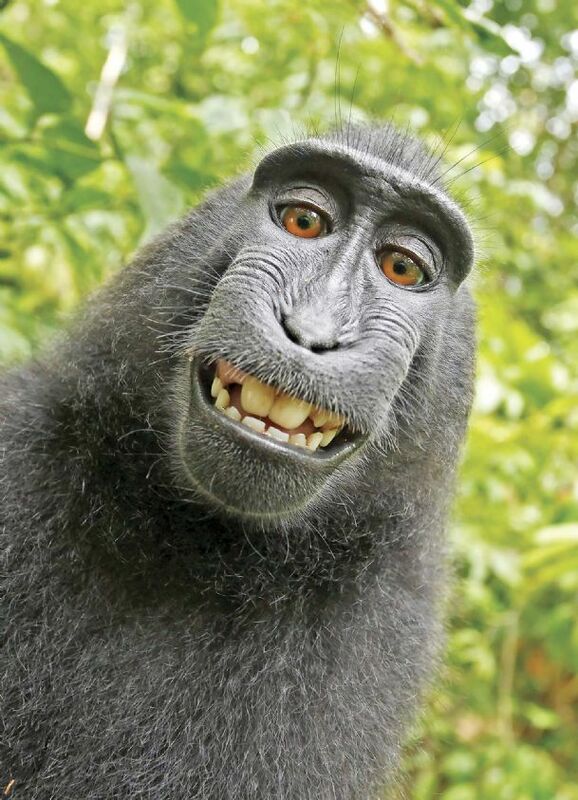 There does not seem to be an exception listed in the Code for income derived from the sales of a monkey selfie, which is to suggest the taxpayer (ie. Naruto) now owes taxes on his selfie proceeds. This uncovers a whole slew of issues: Is Naruto recognized as a taxpayer? Since he does not and cannot earn income, which tax bracket should he be considered a part of? Can he request deductions when he files his tax return? It is possible that the San Francisco federal court will find Naruto the true owner of the photo and the IRS will somehow find a way to tax the monkey on his gross income earned from photo sales, but it does not make a whole lot of sense. What does a monkey need income for anyways? If Naruto is found to be the owner of property, it is likely the courts and the IRS will have to deal with several additional cases brought by animal lovers on behalf of their pets. From a policy perspective, the courts will now be clogged by cases not only brought by humans, but also by animals. Nice try PETA, but let’s not make property law any more difficult and just leave it humans. Student Bio Sam is a Staff Member of the Journal of High Technology Law. She is currently a 2L at Suffolk University Law School with a concentration in Business. She holds a B.S. in Business Management from Roger Williams University.